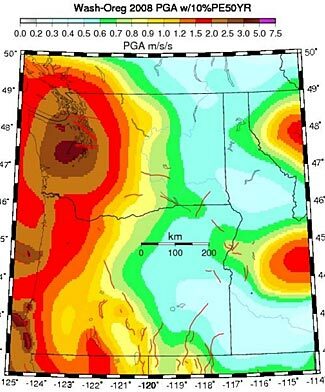 Earthquake danger zones in WA, OR, ID, MT. On Monday we quoted officials in Los Angeles who bravely told the truth and agreed it would be more than three days before any type of relief could be deployed to people after a major earthquake. Their take – people should have enough on hand to be self-sufficient for at least two weeks. On Friday a second story comes out, this time from Seattle, and with Oregon and San Francisco data also linked. In a more detailed article and analysis, the Seattle Times looked at the likely consequences of a major but not improbably large earthquake occurring in the WA/OR region. This chart, using information drawn from a Washington State Seismic Safety Committee report, shows the current shortfall between target recovery times and expected recovery times. The complete 34 page report is available here and on its page 12 is the earthquake danger zone image we use above and an explanation of what it shows. An earlier document here is also helpful in understanding weaknesses, vulnerabilities and dependencies. Not Three Days. And Not Two Weeks. More Like Many Months. We don’t know who started the ‘you should prepare for a three-day outage/disruption’ myth, and perhaps the originator’s intentions were good – on the basis that a three-day supply of life’s essentials are better than no supply at all. But these reports abundantly show that after three days, there will still be next to no infrastructure or emergency support at all if the disruptive event is substantial in nature. Furthermore, why do the quoted officials now talk about two weeks as the time period people should prepare for? Their own studies show that two weeks is also a massively inadequate time frame. Look at the data in their own reports (click the links above). You can live without water for three days, but the target to restore water services is a week, and the current reality of when water supplies would be restored is an entire year. Neither the target nor the reality seem close to acceptable, and clearly we must have our own water supplies. One month for electricity, oil, gas, phone and internet service restoration – that’s the target. The actual time to restore these services is currently projected at three months. Okay, maybe you can live without the internet for three months, but without electricity or gas, and no oil products either (ie no petrol or diesel)? Oregon data is not so clearly presented, but can be seen on the website of their Office of Emergency Management. Kent Yu, who chaired their Oregon’s resilience planning, is quoted as saying that the current advice to stock up on enough water and food to last three days is laughable. But his proposed alternative is only slightly less inappropriate, when he says ‘You need to prepare for at least two weeks’. Clearly the emphasis in his statement needs to be on the modifying phrase ‘at least’. The Seattle Times article lightly touches on the inter-connected nature of disaster recovery when it points out that if there’s no petrol and diesel, relief crews can’t get to where they need to go, and heavy machinery can’t operate. But one wonders just how many inter-connected challenges will only be discovered after a disaster, and one wonders whether the current projected recovery times are realistic or wildly optimistic. For example, the article correctly explains that replacement high voltage transformers would have to be built overseas and shipped here. But the article says that this can take six months to a year – a statement that implies 6 – 12 months is an unusually long period of time. In reality, most other analyses and real world experience points to lead times closer to 3 years from ordering to installing a new high voltage transformer. And, for sure, if there were a sudden surge in demand for replacement transformers, no matter what the current lead times may be, the lead times for an unexpected sudden increase in demand would stretch way out. It is also interesting to view the seventh and eighth slides in this presentation that show the shortfall between targeted ideal response/recovery times and actual expected response times in San Francisco. In particular, note how hospitals, which ideally would be disaster resistant, are expected to be out of service for up to 36 months, and emergency utilities, which ideally should be restored within four hours, are expected to be out for 60 days. Utilities for non-emergency services, which should be restored within 72 hours, are expected to stay out for 60 days. Also notable is the desire to allow 95% of citizens to be able to shelter in place in their homes within 24 hours of an emergency, but the reality suggests it could take up to 36 months for 95% of citizens to return to their homes (and longer for the unlucky remaining 5%). A more detailed analysis on the sixth page of this presentation shows in San Francisco that the authorities actually project that only 85% of residents will be back in their homes within 36 months, leaving now 15% still homeless three years after the event. So, what about public shelters? The aim is to have them operating within 24 hours, the current reality is it might take four months to get them online. So, here’s the question to ask your non-prepped friends. If it takes three years or more to be able to return home, and four months before you can live in a public shelter, and 60 days before there’s any power or water, what are you going to do until then? The Washington State Seismic Safety Committee has, as its objective, a 50 year plan to improve the state’s ability to respond to a major (but not improbable) earthquake. Who knows how long it will actually take, and at present, it has not received any funding or support even to move forward on its 50 year plan. So, for apparently the next 50 years or more in WA, the official state studies confirm what you already know. You’ll be on your own for too long, and if you’re not prepared, your very survival is gravely at risk. Similar studies in Oregon and San Francisco have similar findings. We don’t know where the myth of ‘prepare for a three-day outage’ comes from, and even the new claim of two weeks seems wildly optimistic too. These studies all convincingly point to best case scenarios of weeks, months, and in some cases years of outages. Share this article and our earlier article with your non-prepper friends to show them it isn’t just you who advocates self-sufficiency. The very people your non-prepper friends hope to save them are saying that they can’t do this. It is up to us. Well, 2 weeks is better than 3 days. At least they are moving in the right direction. It really is time for the sheeple to wake up and be prepared for emergencies. It’s Official – L.A. Officials Say : Prep For Two Weeks On Your Own Is Your Money Really Safe In The Bank?